Heavy duty casters casters are ready for the big loads! Put them on your heavy duty material handling equipment and say good- bye to caster problems. Select the type of wheel that best suits your weight and use requirements, then choose the size of caster you need. All popular portions available for attachment to all types of metal or wood furniture. Mounting Height: Top Plate=2- 5/8", Other Stems=29/16"
E 2" x 1- 3/16" O.D. Mounting Height: Top Plate=3- 5/8", Other Stems=3- 9/16"
Finish: High Quality Nickel Plating. E 2" x 1 - 3/16"
Plate Dimensions: Overall: 4" x 1/2"
Hole Spacing (slotted): From: 2- 5/8" x 3- 5/8" To 3" x 3"
Dual-Unison locking system engages both wheel brake and swivel brake lock simultaneously, and is hand or foot operated. When fully locked will not disengage. 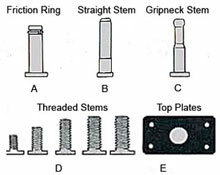 Thread guards standard: Helps keep dirt, dust, and other caster- hazardous materials that affect the wheel bearing. Zerk fittings provided in the axle and swivel for lubrication. Twin wheels make for easy movement over any type of floor. Wheel diameter is 2". Load rating is 160 lbs. per caster. Overall mounting height is 2- 3/4"
and 2- 13/16" for top plate caster. The top plate has an outside dimension o.d. 2- 3/4" by 3- 3/4". The friction ring stem is 7/16" diameter and 1- 3/8" long.